This topic describes the work flow for creating an appointment in RadScheduleView control. RadScheduleView uses one and the same dialog to create and edit appointments. This topic describes the end-user's work flow for creating a new appointment. Enter Subject, Description, Start and End time of the appointment. 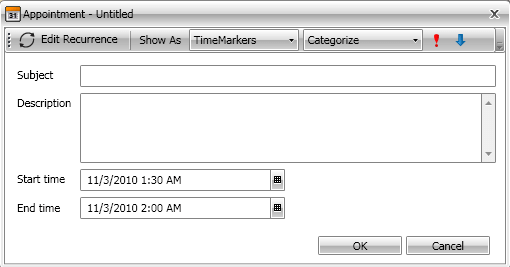 Keep in mind that the subject text will be displayed as label for this appointment in the schedule view. You can also assign a category, time marker or importance by using the tool bar controls. If you have completed the appointment edit, click the 'OK' button or press the Enter key. If you want to cancel the appointment creation, click the X button, the Close button or press the Esc key. Set the properties for the new appointment. Call Commit() method to commit the changes to this object and to update the UI.